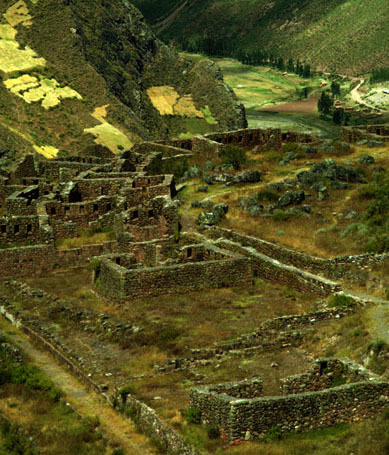 Pisaq is a set of several ruins in Peru's Valley of the Incas, and the nearby modern village. The views herein include the middle and lower ruins, not the upper ruin or the many terraces. Each photo is a link to a larger version of the same photograph. Machu Picchu and the Valley of the Incasl Placemarks. The highest grade of Incan masonry was employed in the buildings of the middle ruins of Pisaq. The projecting round cylinders are roof tie downs. This view faces across the valley (with Pisaq village below) towards Cuzco. 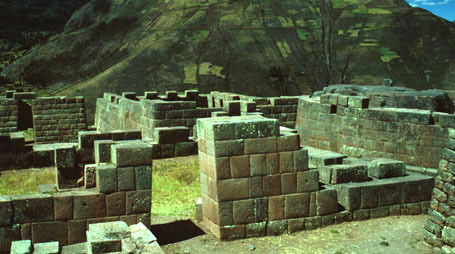 The complex of buildings of the middle ruin surround the Intihuatani, the "Hitching Post of the Sun." The remains of the stone post are visible atop the rock above center on the left. This view faces across the side canyon in the direction of the lower ruins. Note the fields on the mountainside. This close-up of the Intihuatani shows how it was broken off. The Spanish conquerors destroyed every Intihuatani they found. The confluence of the side canyon and the Valley of the Incas is visible below. Pisaq village is on the valley floor just downstream from the confluence. The lower ruins are visible in the center left of this view. The close-up of the lower ruins on the right has the same background as this view. The lower ruins with the valley floor and fields across the side canyon as background. 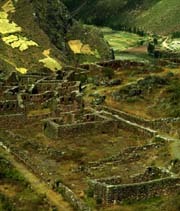 The grade of masonry in the lower ruins does not equal that surrounding the Intihuatani. One of the dangers of farming in Perú is falling out of your fields! Note the terracing in the canyons all the way to the top of the mountain. This is the view from Pisaq village on the valley floor. 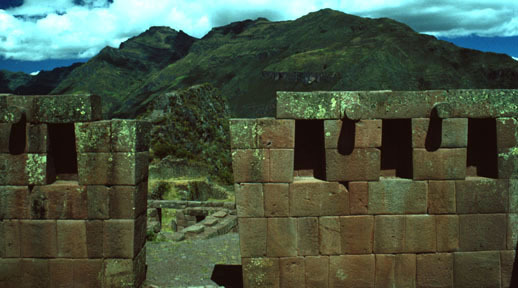 The Inca ruins are to the right of this view. 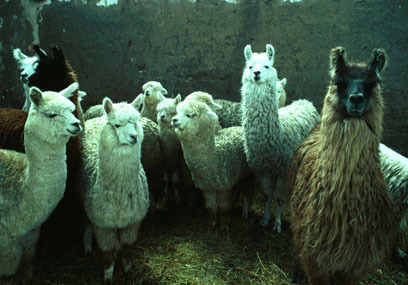 The Andean people domesticated llamas and alpacas at an early date, long before the Inca civilization consolidated the polities of the region. Llamas were the only beast of burden in all the Americas. Their course hair was is woven into cargo bags they transport. They will carry up to about 50 pounds, and if overloaded simply sit down. They are well adapted to the steep mountains. Alpacas are raised for their fine hair and for meat. They are smaller than alpacas and have shorter faces. 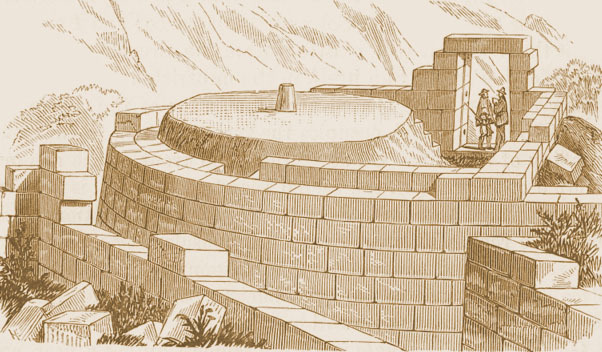 Background image is Pisaq's intihuantani as shown in Squier.